Are you looking for inspiration and research to support yoga in the kindergarten classroom? Kindergarten has become the new first grade. Young students have high expectations in terms of cognitive load and attention span. Recent research indicates that performing yoga in the kindergarten classroom can be very beneficial for young students. What was the study on yoga in the kindergarten classroom? The researchers completed a randomized controlled trial with 45 children in kindergarten. The children were divided into three groups: yoga (twice per week for 30 minutes for 12 weeks), generic physical education (twice per week for 30 minutes for 12 weeks) and no physical activities for the control group. At the start of the study and completion of the 12 week program each child was evaluated with the Visual Attention and Visuomotor Precision subtests of Neuropsychological Evaluation Battery and the Attention-Deficit/Hyperactivity Disorder (ADHD) Rating Scale-IV. No significant differences between groups appeared at the start of the study. The yoga sessions for the students consisted of a 5 minute warm up period, 15 minutes of Asana yoga poses in prone, supine, sitting and standing, 5 minutes of breathing techniques and 5 minutes of yogic games. Stories were told to motivate the children for active participation. The yoga sessions became more difficult as the weeks progressed. reducing the behaviors of inattention and hyperactivity. completion times in two visual motor precision tasks in comparison to the physical education group. visual attention scores in comparison to the control group. 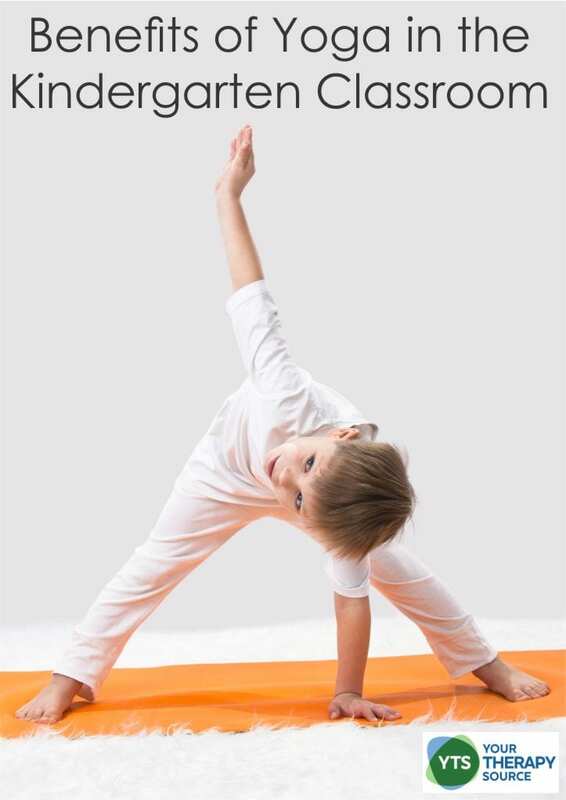 The researchers concluded that yoga in the kindergarten classroom improves selected visual attention and visual-motor precision skills and decreases the behaviors of inattention and hyperactivity in 5-year-old children. Jarraya, S., Wagner, M. O., Jarraya, M., & Engel, F. A. (2019). 12 weeks of Kindergarten-based yoga practice increases visual attention, visual-motor precision and decreases behavior of inattention and hyperactivity in 5-year-old children. Frontiers in Psychology, 10, 796. Are you looking for resources to include yoga in the classroom at your school? Perhaps you need new yoga resources to spark your imagination, provide ideas, and save you time? Yoga in the Classroom will help you powerfully teach yoga in the classroom with this wide variety of digital downloads including books, cards, and posters! You’ll have the confidence and new ideas to hit the ground running! Created by a yoga instructor with a Masters of International Education, the vast and carefully curated library of Kids Yoga Stories resources will help you become a yoga powerhouse in the classroom. FIND OUT MORE.